Synopsis (from Goodreads): It all started with an ad in a mail-order bride catalogue . . . 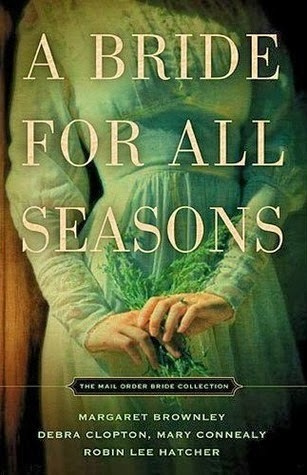 This charming bouquet of novellas introduces you to four Hitching Post Mail-Order Bride Catalogue prospects in the year 1870, all eager for second chances . . . and hungry for happiness. Year in, year out, they'll learn that love often comes in unexpected packages. Mary-Jo has traveled halfway across the country to meet her match, arriving just in time for his funeral. Returning home seems like her only option until her would-be brother-in-law proposes a more daring idea. Ellie had no idea she's not what Matthew ordered. And what's wrong with being a "Bible thumper" anyway? She's determined to show him she's tougher than she looks-and just the girl he needs. David's convinced he's not long for the world. He needs someone to mother his boys when he's gone-nothing more. Can plucky Irish Megan convince him to work at living instead of dying? I have another book written by multiple authors for ya'll! This was a fun read! I found it rather humorous, actually! This collection of novellas from some fantastic writers is a unique collaboration that leaves the reader light-hearted and amused. Basically what happens is that there is a "mail-order-bride" catalogue circulating around old America. It's usually filled with widows, single-parents, and people with a daunting past that they can't seem to escape. The founder of the catalogue, however, has a way of pairing people together in such a way that they are completely unaware that they are looking for exactly what they thought they weren't looking for until they meet. He actually takes their letters to each other, and the man who doesn't want a "bible thumping" bride suddenly needs a "godly woman" to mother his daughter. Whew! You can imagine how that goes. I thought this was a really unique project! Kudos to these amazing ladies who came together and brain-stormed this collection into existence. It's a fun, easy read. Sometimes the stories seemed a little repetitive, but aside from that I really enjoyed it! Follow Lis Ann's board The Indigo Quill on Pinterest. The Indigo Quill. Powered by Blogger.